14,722 others viewed this post. 2 hour and 27 mins of exposure time on The Sculptor galaxy has yielded my best galaxy image yet! That classic side on spiral shape. I used my new trick of using 2 different cameras – one for mono luminance and one for colour. This image is brought to you by Pink Floyd, Mr Robot and a bottle of South American Carmenere wine. 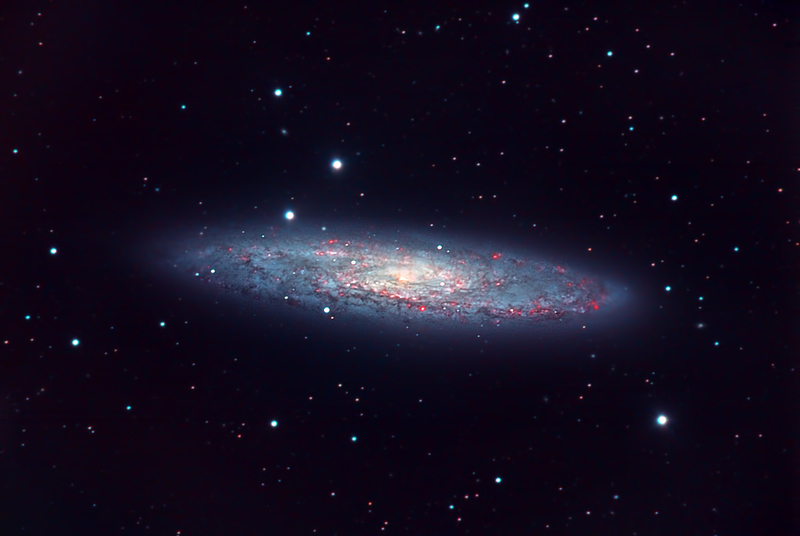 Also known as the Silver Coin or Silver Dollar Galaxy, NGC 253 is an intermediate spiral galaxy and though it looks like a pancake from the side you can make out the spiral nature by looking at the dust lanes curvature throughout. Celestron 9.25″ Edge HD, Lepus 6.3 Reducer, QHY9 mono + QHY12 colour CCDs. Processing in Photoshop and PixInsight. UPDATED : More exposure time and Ha data from John Mills added also.